O God, who for our redemption gave your only-begotten Son to the death of the cross, and by his glorious resurrection delivered us from the power of our enemy: Grant us so to die daily to sin, that we may evermore live with him in the joy of his resurrection. Stir up in your Church that Spirit of adoption which is given to us in Baptism, that we, being renewed both in body and mind, may worship you in sincerity and truth; through Jesus Christ your Son our Lord, who lives and reigns with you and the Holy Spirit, one God, now and for ever. Amen. Alleluia. Christ, our paschal lamb, has been sacrificed. Therefore, let us keep the feast. Alleluia. Almighty God, who through your only-begotten Son Jesus Christ overcame death and opened to us the gate of everlasting life: Grant that we, who celebrate with joy the day of the Lord's resurrection, may be raised from the death of sin by your life-giving Spirit. Send us into the world in peace, and grant us strength and courage to love and serve you with gladness and singleness of heart; through Jesus Christ our Lord, who lives and reigns with you and the Holy Spirit, one God, now and for ever. Amen. Now God himself and our Father, and our Lord Jesus Christ, we pray that you direct our way unto you, and make all of us increase and abound in love toward one another, and toward all men, even as we do toward you; to the end that we may establish our hearts unblameable in holiness before God, even our Father, at the coming of our Lord Jesus Christ with all his saints. Amen. If you visited the shopping mall this week end, would your visit there help you understand the meaning of Easter? Our culture definitely has an Easter holiday. You can buy chocolate Easter bunnies or real bunnies for your back yard. You can fill your Easter Basket with chocolate eggs and marshmallow baby chicks. You can wear new clothes, and you can even buy eggs from the grocery store all ready colored. If you were an investigator and studied the merchandise in stores, I believe you would be hard pressed to discover the true meaning of Easter. Every other religion has values for behavior. They have leaders and religious teachers. There is one difference. The graves of their religious founders are occupied. Christianity has an empty tomb because Jesus lives. Jesus rose from death and Christianity is based on this historical reality. Is there hope? That is the constant cry of humanity. Easter is the answer to that question. Jesus said, “I am the resurrection and the life. He who believes in me shall have eternal life.” He can make that promise because he himself came from God and the Spirit of God raised his body to life. It was a transformed, glorified, resurrected body, not limited by human time or space. Early that first Easter, somewhere between sunset and early dawn…. Before the women reached the tomb…the darkness of the night was shattered by a radiant burst of energized light. The earth shook. The stone was rolled away. Light exploded from the tomb and the body of Jesus, wrapped in linen shroud, passed through the cloth. It floated back to the stone slab, leaving his imprint. No wonder the guards fainted. Jesus, whom the Jews and Pilate had made sure was dead on Friday….was alive. He did not rise up from the stone slab as you and I might rise from bed early in the morning, throwing back the covers. No. John writes: I ran to the tomb with Peter. I looked in and “saw the strips of linen lying there as well as the burial cloth that had been around Jesus’ head.” He was not there. The resurrected body of Jesus was not bound by the molecules of that linen shroud, nor stone walls. His energized body passed right through the cloth. It fell limp like a glove from which a hand has been removed. His resurrection guarantees that all of his promises are true. Our sins have been forgiven. His resurrection guaranties that we are set free from the fear of death and freed from the unending, overwhelming burden of trying to please God by our own merits and deeds. Is there hope? There is hope for life beyond the grave. The same power that raised Jesus from the dead will also give eternal life to all who confess Jesus as “the way, the truth, and the life.” Without this Easter event…you and I would be without hope. There would be a nagging emptiness in your soul. Why? But there is a battle raging for the hearts and minds of people. It’s Easter, an epic celebration of the resurrection of Jesus, the resurrection is the one truth upon which hinges all the teachings of God. Is it any wonder that “The Gospel of Judas” has again surfaced….just at this time…. The Gospel of Judas, an ancient writing from the 3rd century has been known to exist for over 300 years. But it’s like its some new scientific piece of history “The Gospel of Judas” states that Judas was given secret knowledge by Jesus…. According to the “Gospel of Judas” Jesus wanted death so that he could escape his body. There is no mention of a resurrection. Why do you think the movie “the Da Vinci Code” was released shortly after Easter? What’s going on? Well, folks it’s about truth. And we all know that in our present “secular” culture truth has become relative. The culture would like us to believe that “truth” is up to each individual and that there are no absolutes. One of my favorite lines in Mel Gibson’s “Passion of the Christ” typifies our present day. During the trial of Jesus Pilate asked his wife: “What is truth?” Do you remember her answer? She said; “If you can not see truth when it is in front of you then no one can tell you what it is.” It’s classic. How about you this morning? 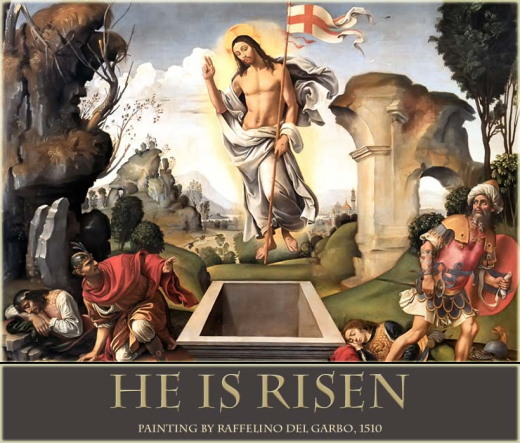 Are you like some in our culture who believe the event of Jesus resurrection is merely alleged? His body was stolen by his disciples? That he later married Mary Magdalene and they had children, and his blood line still survives to this day? God’s word reminds us that “our citizenship is in heaven. We eagerly await a Savior from there, the Lord Jesus Christ, who by the power that enables him to bring everything under his control will transform our bodies so that they will be fashioned like his glorious body.” (Phil. 3:20-21) “For we believe that Jesus died and rose again…. And so we believe….” That God will keep his promise to us. 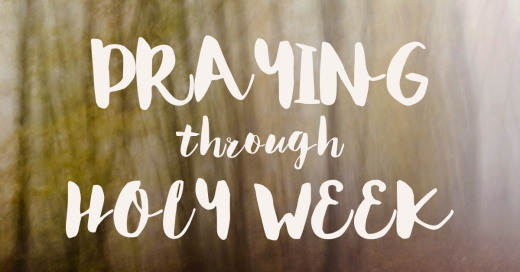 Let us pray: Almighty God, who through your only-begotten Son Jesus Christ overcame death and opened to us the gate of everlasting life: Grant that we, who celebrate with joy the day of the Lord's resurrection, may be raised from the death of sin by your life-giving Spirit. Send us into the world in peace, and grant us strength and courage to love and serve you with gladness and singleness of heart; through Jesus Christ our Lord, who lives and reigns with you and the Holy Spirit, one God, now and for ever. Amen. The Bible texts of the Old Testament, Epistle and Gospel lessons are from the New Revised Standard Version Bible, copyright 1989 by the Division of Christian Education of the National Council of the Church of Christ in the USA, and used by permission. Sermon contributed by Pastor Clarence Eisberg, Redeemer Lutheran Church (LCMS), Fresno, California on Apr 11, 2006. O God, who for our redemption gave your only-begotten Son to the death of the cross, and by his glorious resurrection delivered us from the power of our enemy: Grant us so to die daily to sin, that we may evermore live with him in the joy of his resurrection. Stir up in your Church that Spirit of adoption which is given to us in Baptism, that we, being renewed both in body and mind, may worship you in sincerity and truth; through Jesus Christ your Son our Lord, who lives and reigns with you and the Holy Spirit, one God, now and for ever. Mark 16:6 (NIV) “Don’t be alarmed,” he said. “You are looking for Jesus the Nazarene, who was crucified. He has risen! He is not here. See the place where they laid him. So the disciples were shocked to find an angel waiting for them with the good news: “Don’t be alarmed,” he said. “You are looking for Jesus the Nazarene, who was crucified. He has risen! He is not here. See the place where they laid him” (Mark 16:6). 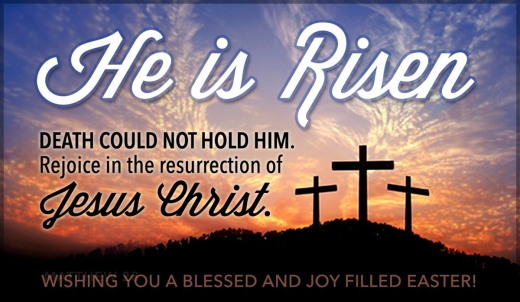 Because Jesus has died and has risen again, it means that we as believers do not have to be afraid of death. As 1 Corinthians 15:20 tells us, “ But Christ has indeed been raised from the dead, the firstfruits of those who have fallen asleep.” Jesus has gone to the other side, He has returned, and He has the keys to death and hell (see Revelation 1:18). God our Father, by raising Christ your Son you conquered the power of death and opened for us the way to eternal life. Let our celebration today raise us up and renew our lives by the Spirit that is within us. Grant this through our Lord Jesus Christ, your Son, who lives and reigns with you and the Holy Spirit, one God, for ever and ever. Amen. Then Simon Peter came, following him, and went into the tomb. He saw the linen cloths lying there, and the face cloth, which had been on Jesus' head, not lying with the linen cloths but folded up in a place by itself. Such a quiet, homely beginning for the day that changed the world. A beginning like any other -- one that says "This is home; this is comfort; this is your life where you belong." 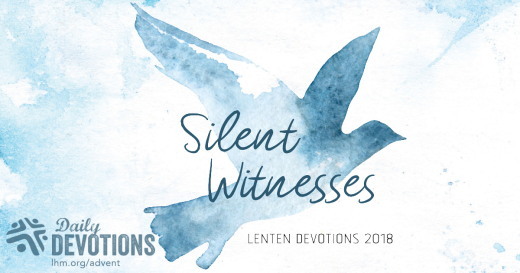 A beginning unlike any other -- because this is the day that sees death undone, first for Jesus, and ultimately for every Christian who belongs to Him. Now we do not need to be afraid. Jesus our Lord goes with us, through life and suffering and death and life again. He knows the way, and He holds us safe through all terrors. 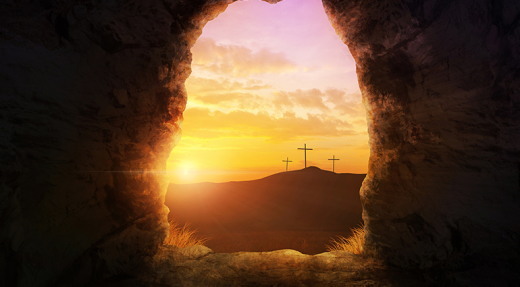 And just as it was for Him, so it will be for us some day: we will rise from our graves to enjoy the eternal life He gives -- the life that is home, that is comfort, that is where we belong -- forever -- with Jesus. Who first taught you to fold or hang up your clothing? Tras él llegó Simón Pedro, y entró en el sepulcro, y vio los lienzos puestos allí; pero el sudario, que había estado sobre la cabeza de Jesús, no estaba puesto con los lienzos, sino enrollado en un lugar aparte. Sin duda un comienzo muy tranquilo y familiar para el día que cambió al mundo. Un comienzo como cualquier otro, uno que dice: "Estoy en casa, me siento cómodo, aquí pertenezco". Pero también un comienzo como ningún otro: porque ese es el día en que la muerte fue vencida, primero para Jesús y finalmente para cada persona que le confiesa como Señor y Salvador. ¿Quién te enseñó primero a doblar o colgar tu ropa? Susannah Cibber est devenue célèbre au XVIIIe siècle tant pour sa superbe voix que pour ses scandales matrimoniaux. Voilà pourquoi, lorsque l’on a interprété le Messie, de Haendel, à Dublin pour la première fois, en avril 1742, beaucoup de gens dans l’auditoire ont désapprouvé le rôle de soliste qu’elle y tenait. Le lien entre Susannah Cibber et le thème du Messie, de Haendel, est évident. C’est à cause du péché que l’« homme de douleur » – Jésus, le Messie – a été « [méprisé] et abandonné ». Le prophète Ésaïe a dit : « [Par] sa connaissance, mon serviteur juste justifiera beaucoup d’hommes, et il se chargera de leurs iniquités » (V. 11). Or, le même lien nous unit au Messie. Que l’on soit du côté de l’auditoire désapprobateur, de celui de Susannah Cibber ou quelque part entre les deux, nous devons tous nous repentir et recevoir le pardon de Dieu. Par sa vie, sa mort et sa résurrection, Jésus nous a réconciliés avec notre Père céleste. Pour cela – pour tout ce que Jésus a fait –, que nos péchés nous soient pardonnés ! Alléluia ! Car le Seigneur […] est entré dans son règne.